Welcome to the Writers Studios at Hutton Hotel – two discrete, creative spaces for you to think, write, and lay down tracks without distractions. 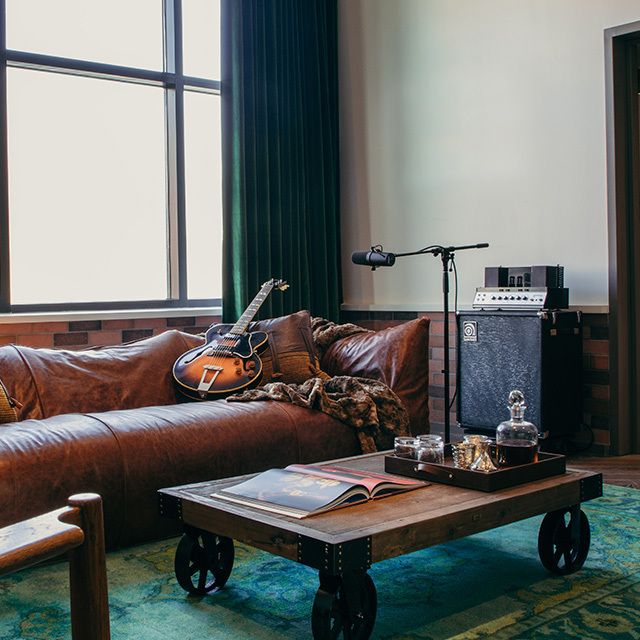 With one customized by Dierks Bentley and the other by Ryan Tedder, each room features a diverse lineup of modern and retro-style gear ranging from premium tube amps to handcrafted microphones. Combined with acoustics designed by Michael Cronin, you know every detail was specifically curated to ensure your sound quality and creative output stays true to your vision. 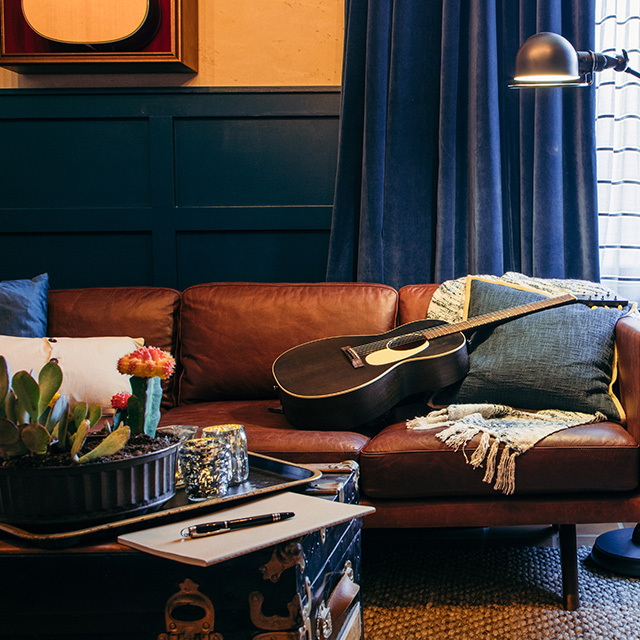 Designed by Dierks Bentley, the West Studio provides some of his favorite guitars, analog and digital equipment, plus a southwestern aesthetic to inspire your creative process. Designed by Ryan Tedder, the East Studio offers essential recording equipment plus a broad selection of guitars sourced from Gibson's headquarters, right here in Nashville. Whether it happens on a tour bus, backstage at a show, or in the nocturnal hours, the inspiration for a song can strike anywhere, anytime. These studios were created to give you both the basic equipment and nice-to-haves for a productive session. So when inspiration strikes again, you'll be ready. If you would like to reserve one of our Writers Studios, please fill out the form to the right. Don't forget to check out Analog, Hutton Hotel's new live music venue and lounge. Thanks for submitting a reservation request. Someone from our team will review your submission and be in touch within 24 hours. Imagine getting an extra hour of sleep because your commute is only a few steps away. At Hutton Hotel, you can roll out of bed and straight into the booth, or you can record pickups before hitting the pillow. Either way, we'll make sure your stay is synchronous with convenience and ease. Sometimes seeing the same view from a new perspective is all you need to spark a sudden inspiration. Top of the line instruments and equipment right when and where you'll need it most. Join us for a session today. Whether you're remixing some 🔥 beats or calm melodies, we have everything you need here at Writers Studios. Merritt Hospitality, LLC, a Delaware limited liability company, doing business as HEI Hotels & Resorts (hereinafter “HEI”) and its affiliates, values you as our guest. HEI is a third party hotel manager that oversees the operations of its hotel properties on behalf its owners. We recognize and understand that privacy and protection of your information is important to you. We want you to be familiar with how we collect, use and disclose data. Via HTML-formatted email messages that we send you that link to this Privacy Statement and through your communications with us. When you visit or stay as a guest at one of our properties. Online Services. We collect Personal Data when you make a reservation, purchase services from our Websites or Apps, communicate with us, or otherwise connect with us or post to social media pages, or sign up for a newsletter or participate in a survey, contest or promotional offer. Owners and Franchisees. We collect Personal Data from Owners of HEI properties that we manage on their behalf.. Owners and Franchisees are independent from the HEI. Strategic Business Partners. We collect Personal Data from companies with whom we partner to provide you with goods, services or offers based upon your experiences at our properties or that we believe will be of interest to you (“Strategic Business Partners”). Examples of Strategic Business Partners include on-property outlets, travel and tour partners, rental car providers and travel booking platforms. Strategic Business Partners are independent from HEI. If you do not want data collected with cookies, you can learn more about controlling cookies at: http://www.allaboutcookies.org/manage-cookies/index.html. Adobe Flash technology (such as Flash Local Shared Objects (“Flash LSOs”)) and other similar technologies. We collect data through Flash LSOs and other technologies on some Websites to, among other things, collect and store data about your use of the Online Services. If you do not want Flash LSOs stored on your computer, you can adjust the settings of your Flash player to block Flash LSO storage using the tools contained in the Website Storage Settings Panel at http://www.macromedia.com/support/documentation/en/flashplayer/help/settings_manager07.html. You can also control Flash LSOs by going to the Global Storage Settings Panel at http://www.macromedia.com/support/documentation/en/flashplayer/help/settings_manager03.html and following the instructions (which include instructions that explain, for example, how to delete existing Flash LSOs (referred to as “information” on the Macromedia site), how to prevent Flash LSOs from being placed on your computer without you being asked, and (for Flash Player 8 and later) how to block Flash LSOs that are not being delivered by the operator of the page you are on at the time). Please note that setting the Flash Player to restrict or limit acceptance of Flash LSOs may reduce or impede the functionality of some Flash applications, including those used with the Online Services. For more information, please refer to https://helpx.adobe.com/flash-player/kb/disable-local-shared-objects-flash.html. We use Personal Data and Other Data to provide you with Services, to develop new offerings and to protect HEI and our guests as detailed below. In some instances, we will request that you provide Personal Data or Other Data to us directly. If you do not provide the data that we request, or prohibit us from collecting such data, we may not be able to provide the requested Services. HEI. We disclose Personal Data and Other Data to other companies within HEI for the purposes described in this Privacy Statement, such as providing and personalizing the Services, communicating with you, facilitating the loyalty programs, and to accomplish our business purposes. HEI is the party responsible for the management of the jointly-used Personal Data on behalf of its owners. We share your Personal Data and Other Data used for making a reservation with the applicable property to fulfill and complete your reservation. Owners and Franchisors. We disclose Personal Data and Other Data to Owners and Franchisors of HEI for the purposes described in this Privacy Statement, such as providing and personalizing the Services and facilitating the loyalty programs. Corporate Reorganization. We may disclose or transfer your Personal Data and Other Data to a third party in the event of any reorganization, merger, sale, joint venture, assignment, transfer or other disposition of all or any portion of the HEI’s business, assets or stock (including any bankruptcy or similar proceedings). We will use and disclose Personal Data as we believe to be necessary or appropriate: (a) to comply with applicable law, including laws outside your country of residence; (b) to comply with legal process; (c) to respond to requests from public and government authorities, including authorities outside your country of residence and to meet national security or law enforcement requirements; (d) to enforce our terms and conditions; (e) to protect our operations; (f) to protect the rights, privacy, safety or property of HEI, you or others; and (g) to allow us to pursue available remedies or limit the damages that we may sustain. This Privacy Statement does not address, and we are not responsible for the privacy, data or other practices of any entities outside of HEI, including Franchisors, Owners, Strategic Business Partners or any third party operating any site or service to which the Services link, payment service, loyalty program, or website that is the landing page of the high-speed Internet providers at our properties. The inclusion of a link on the Online Services does not imply endorsement of the linked site or service by us. We have no control over, and are not responsible for, any third party’s collection, use and disclosure of your Personal Data. If you no longer want to receive marketing-related emails, you may opt out by visiting our unsubscribe page by writing an email to [email protected] or by following the instructions in any such email you receive from us. Because your email communications to us may not always be secure, please do not include credit card or Sensitive Data in your emails to us.